This classically styled military ornament praises the accomplishments of a special serviceman. The Army ornament is part of our armed services ornament collection, and makes a great gift to a special soldier. We will personalize the resin Army ornament with the recipient's rank and last name or your custom sentiment on up to two lines on the star. You may also add the year at your option on the banner as shown. 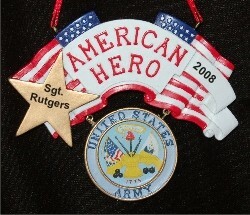 The Army ornament measures 4.25"W x 3.4"H and includes our holiday cord for convenient hanging. To complete the presentation, the Army ornament arrives nestled within our exclusive black velvet drawstring bag, ready to make a perfect personalized ornament gift. For Uncle Nov 11, 2014 Kimberly H.